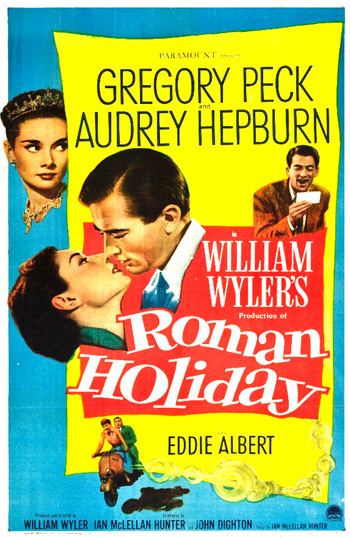 Roman Holiday (1953) is a delightful, captivating fairy-tale romance shot entirely on location in Rome, and produced and directed by one of Hollywood's most skillful, distinguished, professional and eminent directors - William Wyler. The film's bittersweet story is a charming romantic-comedy, a kind of Cinderella storybook tale in reverse (with an April-October romance). A runaway princess named Princess Ann (Audrey Hepburn), during a goodwill tour of Europe, rebels against her sheltered life and royal obligations. She escapes the insulated confines of her royal prison to find a 'Prince Charming' commoner - an American journalist-reporter (Gregory Peck) covering the royal tour in Rome. The story was reportedly based on the real-life Italian adventures of British Princess Margaret. Award-winning director Wyler was known for other great films including Dodsworth (1936), Jezebel (1938), Wuthering Heights (1939), The Letter (1940), two 1940s Best Picture winners: Mrs. Miniver (1942) and The Best Years of Our Lives (1946), The Heiress (1949), Friendly Persuasion (1956), Ben-Hur (1959) and Funny Girl (1968). Wyler's well-crafted, stylish films that cover a wide range of film genres (family dramas, westerns, epics, romantic comedies, and even one musical) always included down-to-earth characters in real-life situations. The film received a phenomenal ten Academy Award nominations for a comedy. It won a Best Actress Oscar for its under-experienced British (Belgium-born) actress named Audrey Hepburn - it was her first American film, although she had previously appeared in six European movies (including Laughter in Paradise (1951, UK), The Lavender Hill Mob (1951, UK), and Secret People (1952, UK)), and on Broadway in an adaptation of Colette's Gigi. The fact that Hepburn was basically an unknown actress heightened the story's plot. She soon blossomed into a true star - both within the film and afterwards. She proceeded to garner four more career Oscar nominations (all for Best Actress) for Sabrina (1954), The Nun's Story (1959), Breakfast at Tiffany's (1961) and Wait Until Dark (1967). Hepburn also starred in other classics, including Funny Face (1957), Charade (1963), My Fair Lady (1964), and Two For the Road (1967). Another of the film's three Oscar awards, the one for Best Original Story was given to Ian McLellan Hunter. In 1992, a posthumous Oscar was properly credited and given to blacklisted Hollywood Ten author Dalton Trumbo, who actually wrote the screenplay. The third Oscar it received was for Best B/W Costume Design (Edith Head). The gamin actress Hepburn set new fashion trends with her short hair and casually-chic costumes in the film. The other seven nominations included: Best Picture, Best Supporting Actor (Eddie Albert), Best Director, Best Screenplay (Ian McClellan Hunter and John Dighton), Best B/W Cinematography, Best B/W Art Direction/Set Decoration, and Best Film Editing. Paramount News brings you a special coverage of Princess Ann's visit to London, the first stop on her much-publicized, goodwill tour of European capitals. She gets a royal welcome from the British, as thousands cheer the gracious young member of one of Europe's oldest ruling families. After three days of continuous activity and a visit to Buckingham Palace, Ann flew to Amsterdam, where her Highness dedicated the new International Aid Building and christened an ocean liner. Then went to Paris, where she attended many official functions designed to cement trade relations between her country and the Western European nation. And so to Rome, the Eternal City, where the Princess' visit was marked by a spectacular military parade...The smiling young Princess showed no sign of the strain of the week's continuous public appearances. And at her country's Embassy that evening, a formal reception and ball in her honor was given by her country's Ambassador to Italy. During her royal state visit to Rome, Italy, she is presented to the guests during the extravagant ball, escorted into the room wearing a beautiful gown and crown of jewels. Performing her expected diplomatic duties, she appropriately greets the Papal Nuncio, Monsignor Altomonto (Giacomo Penza), Sir Hugo Macy de Farmington (Eric Oulton), the Maharajah of Khanipur (Rapindranath Mitter) and Rajkumari (Princess Lilamani), Prince Istvan Barossy Nagyavaros (Cesare Viori) and many others, but the young foreign Princess reveals her weariness of the proceedings. Under her long gown, she wiggles and itches her foot and then embarrasses herself by losing her high heeled shoe. She retrieves it when she stands to dance with a steady procession of admirers and guests. Ann: I hate this nightgown. I hate all my nightgowns, and I hate all my underwear too. Ann: But I'm not two hundred years old. Why can't I sleep in pajamas? Ann: Just the top part. Did you know that there are people who sleep with absolutely nothing on at all? Looking out her window, she catches a glimpse of how the other half lives, a scene of Roman nightlife. When she is brought warm milk and crackers before retiring, she scoffs: "Everything we do is so wholesome!" The review of her tightly-arranged royal schedule for the next day (including rules of decorum, how she will act and what she will wear) reveals ceremonial visits to a car factory, a food and agricultural inspection organization and an orphanage, followed by a press conference, lunch with the foreign ministry, and even more affairs of state later in the day. The Princess screams: "STOP! ", hysterically exasperated and depressed by the constant control and regimentation of her life. As she is given a sedative by a doctor, she tells her guardians: "...I'll be calm and relaxed, I-I'll bow and I'll smile and improve trade relations and I'll..." In reality, she is determined to see Rome for herself and on her own terms. To escape the endless tedium of the many ceremonial occasions, to find adventure and to experience life beyond the claustrophobic confines of her royal position - without royal control - she slips out of the palatial Embassy that night. Unseen, Ann climbs into the back of an open supply truck (Domenico Pizzatti - Rinfreschi -) that is allowed to leave the Embassy grounds. For the first time, unescorted and unchaperoned, she smiles as she watches her liberating passage through the Embassy's gates. When the truck stops, she jumps out and finds herself in the middle of Rome, becoming increasingly drowsy from the effects of the sleep-inducing sedative. She falls asleep on a low park wall. On his walk home following a late-night card game which has impoverished him with his pals, street-smart American newspaperman Joe Bradley (Gregory Peck), one of the many reporters who was planning to interview the Princess the next day, walks by the sleeping beauty. She is singing to herself: "So happy." He finds it ironic that she is "well-read, well-dressed" and "snoozing away on a public street" like a drunk. Taking pity on her because she has no money ("Never carry money"), the protective journalist signals a taxi and they climb in the back seat. Perplexed that she sleepily responds that she lives "at the Coliseum," he directs the taxi to his own apartment and then realizes that she must spend the night there. Ann: Can I sleep here? Joe: Well, that's the general idea. Ann: (regally) Will you help me get undressed, please? Ann: May I have some? Joe: (firmly) No. Now look. Ann: This is very unusual. I've never been alone with a man before - even with my dress on. (She begins unbuttoning and removing her blouse) With my dress off, it's most unusual. I don't seem to mind. (She gazes directly at him.) Do you? Joe: (stony-faced) I think I'll go out for a cup of coffee. You'd better get to sleep. (She flops on his bed.) No, no, no. (He leads her toward the couch.) On this one. Joe: Hey - these are pajamas. They're to sleep in. You're to climb into them, you understand?...Then you do your sleeping on the couch, see. Not on the bed, not on the chair, on the couch. Is that clear? Ann: "Arethusa rose from her couch of snows in the Acroceraunian mountains" - Keats. Joe: Now, you just keep your mind off the poetry and on the pajamas, and everything'll be all right, see. Joe: Now, I'll be - it's Shelley - I'll be back in about ten minutes. Ann: Keats. (He approaches his front door and hides his wine bottle on the top of the mantelpiece.) You have my permission to withdraw. When Joe returns to his small apartment about ten minutes later, he finds the princess in his own bed - not on the chair or couch as he had instructed. He rolls her off his bed onto the couch. The princess' disappearance is classified as a "Top Crisis Secret" when it is discovered that the "direct heir to the throne" is missing at the Embassy. A diplomatic cover-up conceals the real facts: "A SPECIAL EMBASSY BULLETIN REPORTS THE SUDDEN ILLNESS OF HER ROYAL HIGHNESS THE PRINCESS ANN." Joe: That's certainly pretty hard to swallow. Joe: How much would a real interview with this dame be worth? Joe: I'm not referring to Annie Oakley, Dorothy Lamour, or Madame ... How much? Joe: I know, but if I did? How much would it be worth? Joe: I'm talking about her views on everything!...The private and secret longings of a Princess. Her innermost thoughts as revealed to your own correspondent in a private, personal, exclusive interview. (His boss' mouth drops, awe-struck by the thought) Can't use it, huh? I didn't think you'd like it. Joe: Practically all love angle. Joe: Could be. How much? Joe: ...You said five grand? I want you to shake on that.